Kowkabany’s Family Martial Arts (KFMA) has a fairly simple philosophy in our martial arts school. The Kowkabanys believe that the job of martial arts instructors is to help every student to develop the specific gifts they have been given by God so that they can become their best, physically and mentally. Kowkabany’s Family Martial Arts helps their students to be successful, not just on the training floor, but also at home, in school and in the community. The physical training of taekwondo is the instrument martial arts uses to develop an individual. The life skills we teach include integrity, respect, goal-setting, courtesy, self-discipline, loyalty, self-control, and honor. Taekwondo is much more than a “sport,” it is an art, which evolves along with the student depending on where that student is in life. For this reason, many of our students come to us simply to develop these life skills. Our martial arts family center has an open, fun and friendly environment, starting with students as young as four years old, and with adults training in their 70s. Many of the students in our academy train with family members, quite often in the same class. There are very few avenues available where parents and their children can workout together, and we find this quality time spent together is wonderful for building family unity. 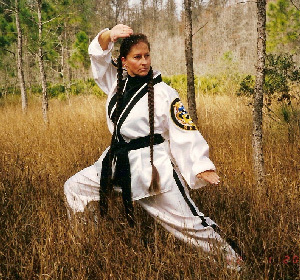 Kowkabany’s Family Martial Arts (KFMA) is a member of the American Taekwondo Association, and is therefore known as an ATA Martial Arts Academy. We take pride in a standard of excellence and regulation unequaled in our industry, a standard met in every one of our 1200 schools nationwide.As an example of what sets our organization apart, the ATA even awards college scholarships. In fact, over the past 5 years, three of our students have earned scholarships ranging from $500 up to $3000. KFMA teaches traditional values in a family atmosphere, and we firmly believe that we provide the highest quality teaching available anywhere. You do not have to be athletic or have any special skills to learn Taekwondo. You do not have to get in shape before you start training, we will take care of that for you.Training with us will change your life in a very positive way! Students come to us for a variety of reasons: to learn effective self-defense skills while getting into the best shape of their lives; to compete at a regional or national level; to develop confidence in social situations, or simply to spend quality time with their family members in a safe, positive environment. All you need to start is a positive attitude and the willingness to try something new. KFMA trains students mentally and physically to be their best. You are encouraged to watch or try a class, to talk with our students, and to ask us any questions you may have. We can and WILL change your life for the better, all you have to do is take that first step.